Burger King Japan is selling Windows 7 burgers. 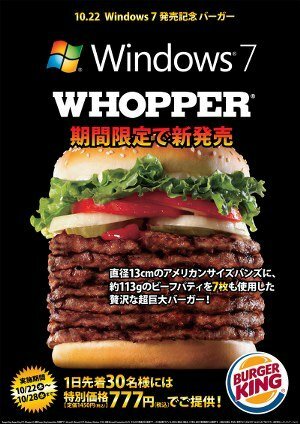 Microsoft has taken this unusual step of promoting Windows 7 in Japan with a Windows 7 burger at Burger King. The burger stacks seven patties in an otherwise normal Whopper & measures 5.1 inches tall. It also has an appropriate 777 yen price tag. UPDATE: Watch one being eaten, here! It is sure to amaze you. Check out Burger King Japan. Incidentally while you are here, you may want to check this! TheWindowsClub.com has released over 75 Freeware, eBooks, Themes, Screensavers, Wallpapers, etc. You can download them all 100% free here. Some of the well-known one’s are Ultimate Windows Tweaker, FixWin, etc. Do let us know what you think of them and share them on the social media if you like them.